“I’m sorry if it took us awhile to go back.” He said during that night. Or something like that. It’s true, it did take him awhile to come back to Manila because when he first played for his Filipino fans, I still haven’t found my first full-time job, my sister just got married, and he shared the stage with his runner-up, David Archuleta! In fact, I documented that epic concert in my previous blog, which you can check out by clicking HERE. …my sister and I are definitely COOKistas! Haha! Indeed, a lot of things have happened since 2009. 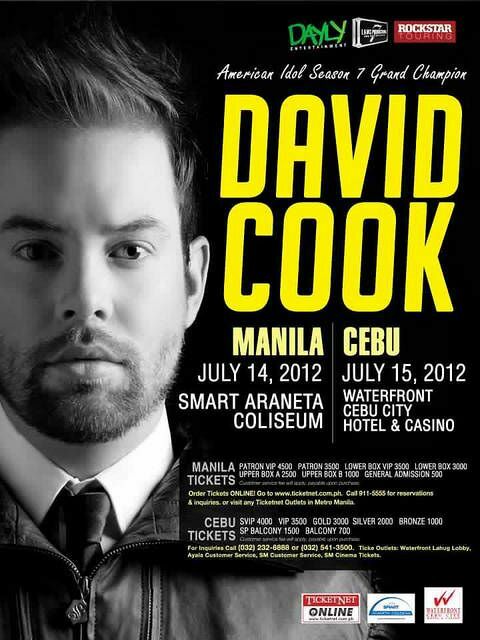 And now that we’re in 2012, these happened: I just resigned from my first full-time job, my niece is about to turn three years old soon, and David Cook (DC) finally decided to have a concert of his own! But one thing remains: my undying love for his angelic-yet-powerful rock voice! And speaking of his “angelic-yet-powerful rock voice,” have you gotten yourself a copy of his latest album This Loud Morning? Well if you still haven’t, I suggest you go get one as soon as you can and turn to tracks like “Right Here, With You,“ “Fade Into Me,“ and “4 Letter Word.“ Why? Wala lang, those are my favorite tracks kasi! Eh nagbabakasakali lang na pareho tayo ng taste in music! Wahahahaha! But seriously, DC‘s voice never fails to put a smile on my face! If only I could describe his voice by using an adjective that is used to describe looks, “gwapo” would be the appropriate one! Oh wait! I did describe his voice like that once, twice, or thrice. Whenever I listen to his songs, bigla nalang ako mapapasabi ng “ang gwapo talaga ng boses niya!” Hahaha!